Who knew? 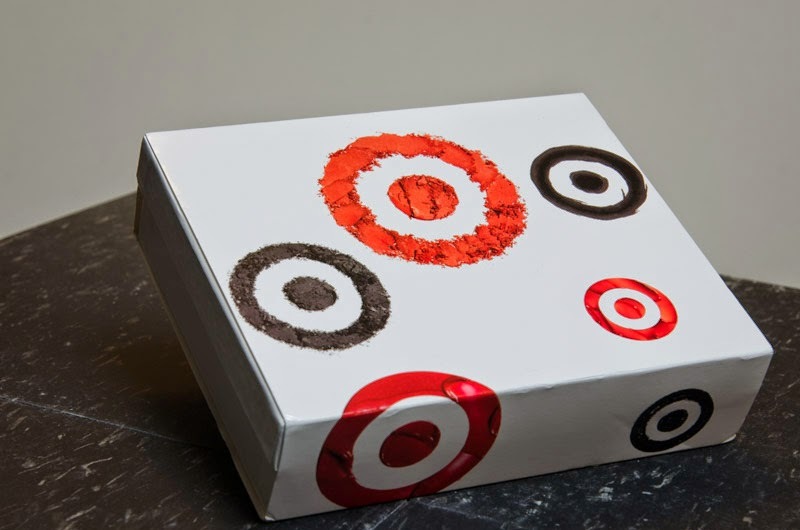 Target has jumped on the subscription box bandwagon! Actually, it looks like this is nothing new. I've heard rumors and stories of mythical makeup bags filled with samples that Target would release to its customers every few months, free of charge. I'm not sure whether these fabled bags were gift-with-purchase deals, or whether they were offered solo, but either way, they are no longer. 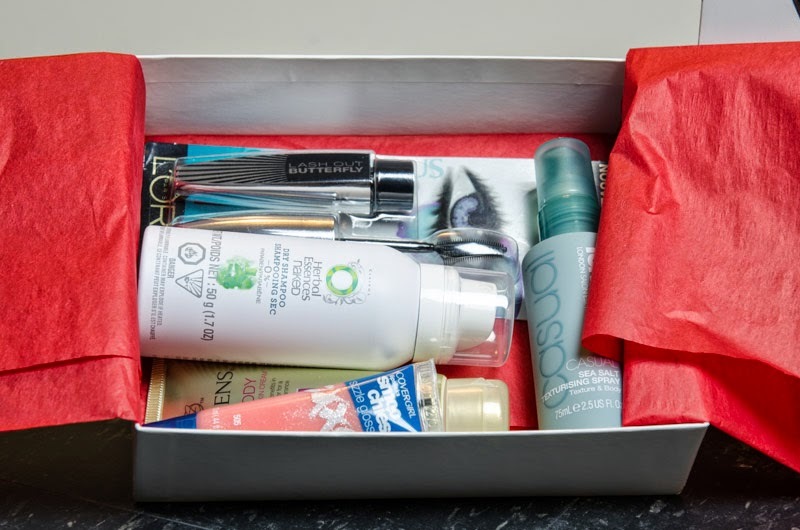 The newest version of the Target Beauty Bag comes in a cardboard box, costs $5, and features full-sized products and deluxe samples. Unfortunately, these guys were a limited edition, and they're no longer available for purchase. Until the next edition rolls around, I hope. I hear (it's all rumor and conjecture with these things!) 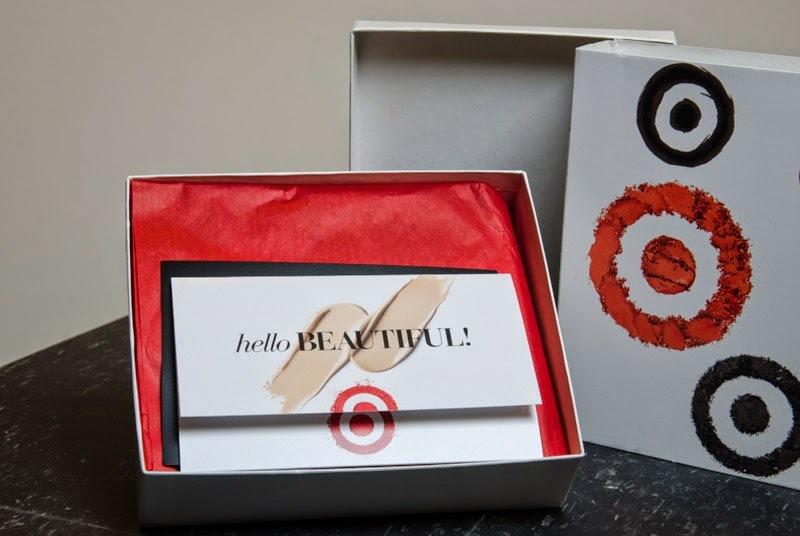 that new beauty bag releases are posted on the Target Style Facebook page, so if you want to snag one of these when they're next offered, you might want to hit "like" and follow. My bag came with an info card listing and briefly describing each of the included products, with a coupon for $3.00 off a Target beauty purchase of $15 or more, and a coupon for 20% off and free shipping on the dermstore, blush, and hairenvy sites. 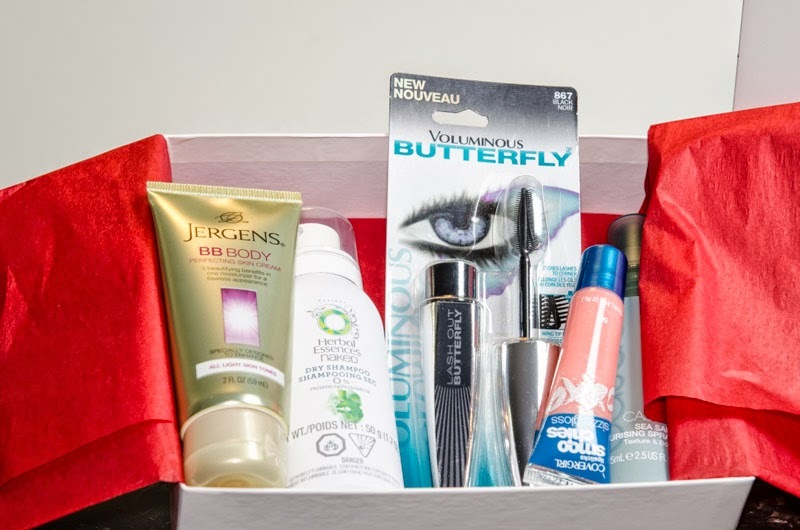 I doubt it's an exclusive coupon, so I'm going to share it with you, too: just enter BEAUTY4U at checkout sometime before June 30 on any or all of the participating sites. Unboxed! Lots of deluxe sample action going on. The loot on display: Two full-sized cosmetics and three deluxe-sample-sized hair and skincare items. A girl can never have too much mascara, even if she is mostly loyal to one particularly foolproof and wonderful orange tube. This aerodynamic "butterfly" applicator promises to "lengthen, stretch and volumize every lash to the outer corners of the eye." Yes, please. This looks really promising, and I can't wait to try it... once my orange tube runs out, that is. 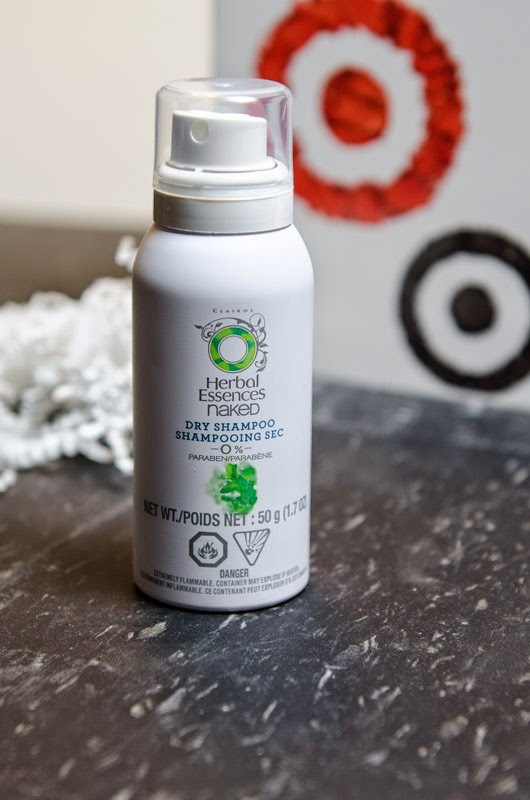 Herbal Essences Naked Dry Shampoo. $4.99 for 4.9 oz. My sample is 1.7 oz, so about $1.70. A girl --this girl, anyway-- can never have too much dry shampoo, either! I have long, straight hair that gets oily and goes limp fast, and short of a shower, there's nothing better to revive second- and third-day hair. I haven't tried Herbal Essences' version yet, but I'm happy to add it to my arsenal of hair secret weapons. Also, the "Naked" in the name isn't just there for shock value: this shamp is paraben- and colorant-free, and made with natural tapioca to absorb oil. Nice! Jergens BB Body Perfecting Skin Cream. $11.95 for 7.5 fl oz. My sample is 2 fl oz, so about $3.19. A BB cream for your whole body? Genius idea! In practice, this cream doesn't really conceal or minimize the appearance of "flaws" (in other words, don't bother using this to camouflage age spots, spider veins, stretch marks, and the like, because it won't) as much as it adds the subtlest hint of a tinted glow. I don't know that how cost-effective it would be to buy this in place of a daily body lotion, but I would definitely use it every now and then on bare arms and legs. As an added bonus, it's really moisturizing, though light, and it smells pretty great. 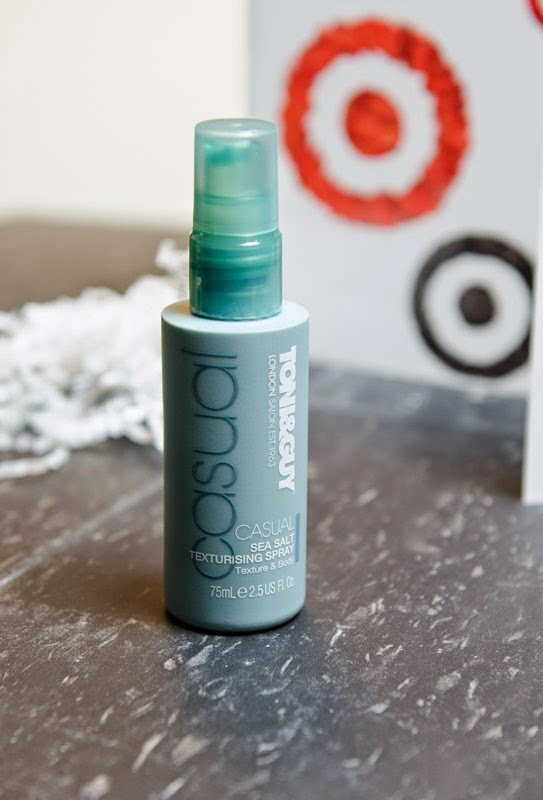 Toni & Guy Sea Salt Texturising Spray. $14.99 for 6.8 fl oz. Also available as a 2.5 fl oz deluxe sample, which is the version I received, for $4.99. This is the second Toni & Guy sea salt spray sample I've received in recent months, and I've yet to try it. I guess I'm scared that spritzing this on my roots will result in creating a matted, unwashed look rather than the preferred beachy, carefree, boho vibe. 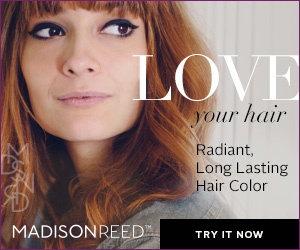 I don't know... Can any of you ladies vouch for this texturizer? Although this might look a bit intimidating in the tube --the petal-pink color, the shimmer, and the Smoochies name kind of skew pre-teen,-- it's actually incredibly wearable in practice. The color I received, Tickled Pink, goes on sheer, and gives only a hint of flattering shimmer. It's super moisturizing and, incredibly, not at all sticky. Plus is smells and tastes like strawberry bubble gum. 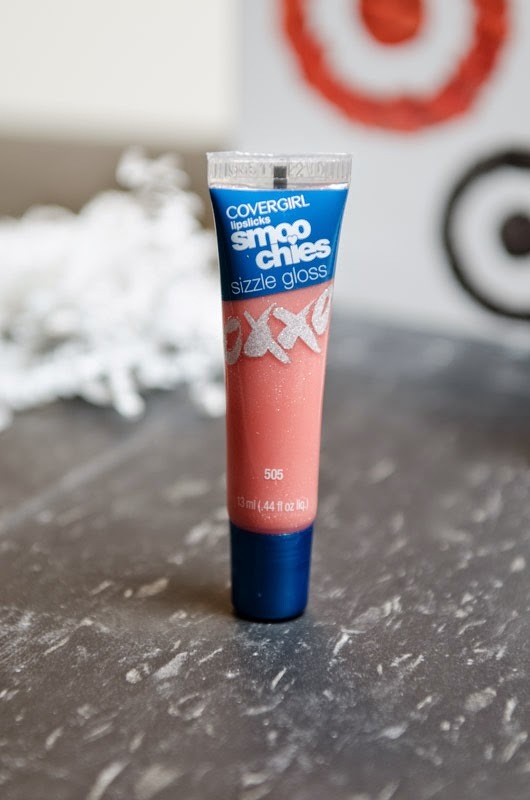 This one really surprised me, and I think it'll be added to the rotation of mainstay lip balms and glosses. All in all, the Target Beauty Box adds up to a $22.26 retail value, which is excellent considering I only paid $5.00, and that shipping was free. (I know there was a temporary snafu that affected some Beauty Box purchases, adding shipping fees in error -- though I believe those shipping fees were later refunded on request.) Granted, these aren't the most exciting or cutting-edge products, they're drugstore standbys; but the way I see it, for less than the price of a mascara I would've bought at Target anyway, I received four other generously-sized beauty samples (three, actually, since the gloss was a full-size), and two coupons to boot. The Beauty Box is so cheap it's almost criminal to pass up! What do you guys think? 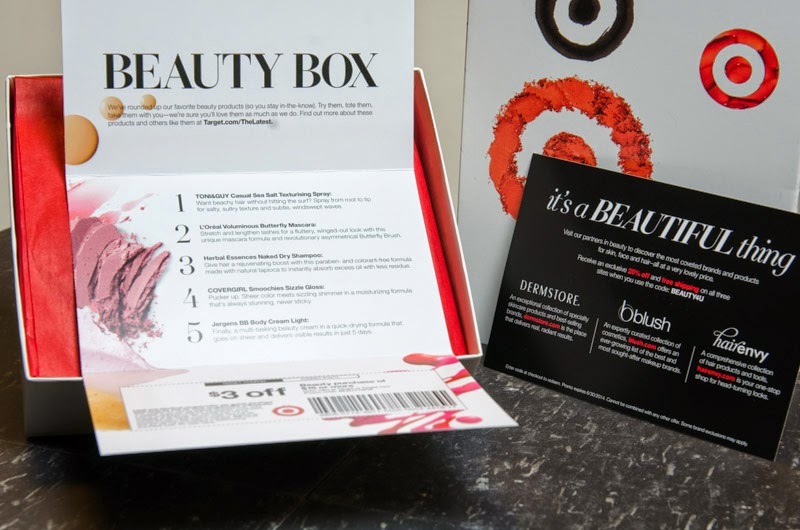 Was this a worthwhile purchase for you, too, or would you rather have had a different experience with the Target Beauty Box? I bought one too so I'd say it was definitely worth it for $5, haha! And I agree with you about the lip gloss - it looks like Barbie Glitter Explosion in the tube, but is totally fine once it's spread out. Right? Totally deceptive packaging! I guess you shouldn't always judge a gloss by its cover (?). I completely agree! Wish I'd bought two! I will happily vouch for the Toni & Guy spray. It's like a scrunch spray had a baby with a hairspray, but it's not sticky. Try eeet! So I did some cautious spritzing last night to create a little volume at the crown, and miraculously ended up with some wavy strands. I'll definitely keep experimenting. Thanks for the push! It would've probably been traded away if not for your comment! 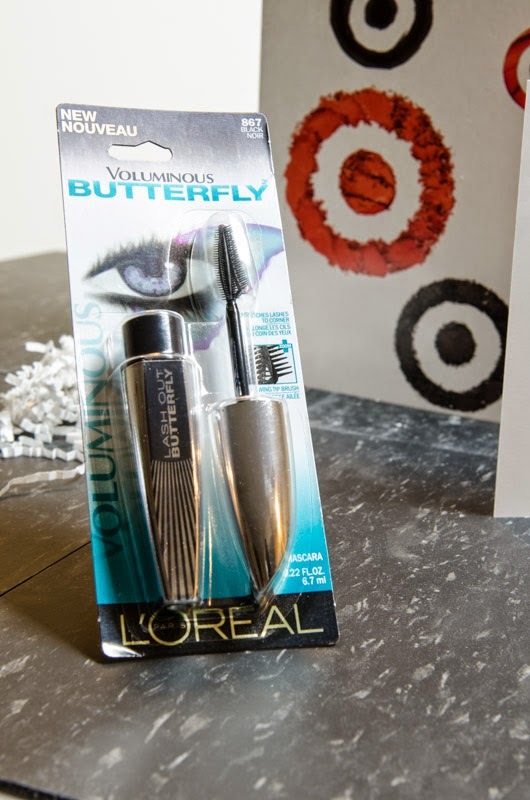 I really like the Mascara, I've been using it almost every day since I got this box. And I'm a pretty loyal Benefit They're Real user. I really like Benefit's mascara too, although it tends to get a little clumpy (at least in my limited experience with it). Still using up my CoverGirl Lash Blast <3, but the L'Oréal tube is next on my to-use list. I like this concept. I visited your blog for the first time and just been your fan. Keep posting as I am gonna come to read it everyday……………….